They’re back. After a wintertime largely devoid of evening worlds, the planets are once again in the evening sky. First Jupiter, then Mars have crossed opposition over the past few months, and now Saturn is set to take center stage later next week, reaching opposition at 7:00 Universal Time (UT) on the night of June 2/3rd. This places the ringed world in a position of favorable evening viewing, rising in the east as the Sun sets in the west, and riding highest near local midnight across the meridian. Opposition 2016 sees the planet Saturn looping through the southern realm of the constellation Ophiuchus, making a retrograde run this summer at the Scorpius border before looping back and resuming eastward motion. That’s right: Saturn currently occupies the dreaded ‘13th house,’ of Ophiuchus, for all you Snake-Bearers out there. Saturn is currently at bright as it can be, at magnitude +0.04. Saturn rising on the night of June 2nd. Image credit: Starry Night Education Software. Saturn reaches opposition once every 378 days, as it orbits the Sun at a leisurely pace every 29.5 years. 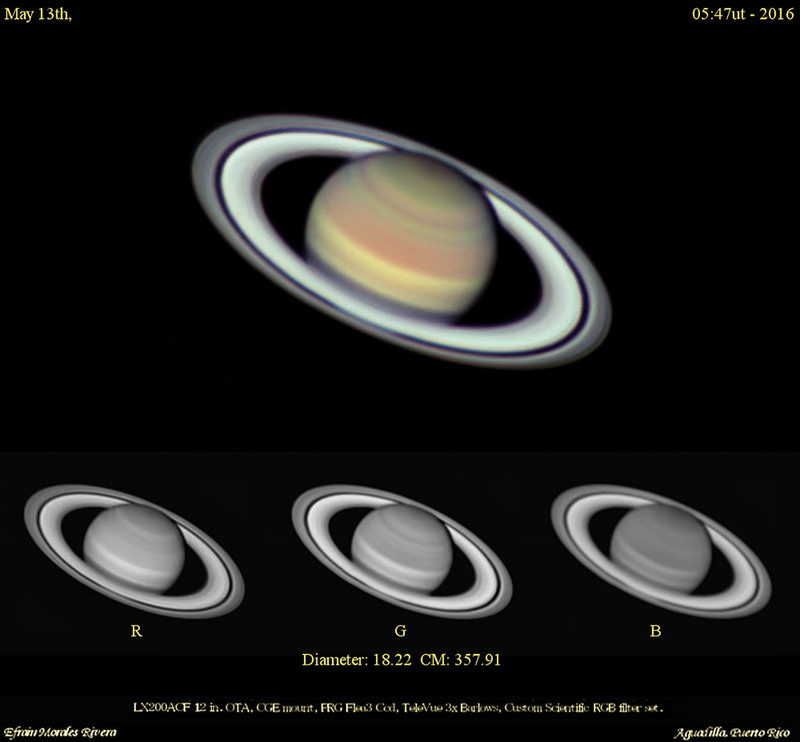 2016 and the next few oppositions sees Saturn ‘bottoming out,’ sitting around -20 degrees south. Saturn won’t peek northward across the celestial equator again until March 2026. This places the 2016 appearance of Saturn high in the sky south of the equator, transiting about 30 degrees above the southern horizon around midnight for folks observing around 40 degrees north latitude. Saturn also begins looping towards the star-rich region of the galactic equator for a crossing it late next year in December 2017. Saturn sits 9 Astronomical Units (AU) or 1.4 billion kilometers distant on June 3rd, a slightly larger distance than usual, owing to the fact that the planet is headed towards aphelion on April 17th, 2018. The waxing gibbous Moon passes 3.2 degrees north from Saturn on Sunday, June 19th, just a day before reaching Full. Watch for a sudden brightening of the planet in early June, known as an ‘opposition surge’ due to what is known as the Seeliger effect. This is a coherent back-scattering of light, focusing it similar to highway retro-reflectors shining your headlights back at you at night. In this case, the Sun is the ‘headlight,’ and the millions of snowball moonlets hiding their shadows from view reaching 100% illumination are the highway retro-reflectors. The effect is subtle, to be sure, but serves to raise the brightness of the planet by about half a magnitude. This should be apparent in an animation sequence shot before, during and after over the span of a about a week. Any takers? Almost there… the widening tilt of Saturn’s rings. image credit and copyright: Andrew Symes (@failedprotostar). And speaking of the rings, here’s another reason to check out Saturn this opposition 2016 season. The tilt of rings is about 26 degrees wide as seen from our Earthly perspective… about as wide as they can be. Saturn’s rings were last edge on in 2009, and reach a maximum width of 27 degrees on October 16th, 2017 before slowly heading towards edge on again in 2025. The path of Saturn through the last half of 2016. Image credit: Starry Night Education software. At the eyepiece, Saturn shows a yellowish disk 18” extended to 43” across if you count the rings. Crank up the magnification to over 100x under good seeing, and the black thread of the Cassini division jumps into view. Saturn has 62 moons in all, with +9th magnitude Titan being the brightest. You’re looking at the most distant surface outpost of humanity, the site of the 2005 landing of the European Space Agency’s Huygens lander. Six moons are readily visible in a small telescope, while the fainter moons Hyperion and Phoebe present a challenge to owners of extreme light buckets. Also, as Saturn heads past opposition and towards eastern quadrature 90 degrees from the Sun on September 2nd, 2016, watch for the shadow of the bulk of the planet, cast back across the rings. A sampling of the Moons of Saturn. Image credit: Stellarium. We never miss a chance to observe Saturn if it’s above the horizon. Saturn is a sure-fire crowd-pleaser for any sidewalk astronomy session, and no one forgets their first glimpse of the glorious ringed world. You can just imagine how much consternation this bizarre-looking planet must have caused Galileo. You can tell just how primitive his first telescope was, as his sketches show off Saturn as more of a two-handled ‘coffee cup’ in appearance. Christaan Huygens first deduced something of the true nature of Saturn’s rings in 1655, correctly claiming that they are physically separated from the disk. Don’t miss Saturn at opposition next week! Looking for something truly elusive? Astronomy has no shortage of the fleeting and ephemeral when it comes to challenges. This week’s challenge will require supremely dark skies and persistence.